From code carts to treatment carts, anesthesia carts and more, Health Care Logistics offers an extensive line of durable, dependable crash carts and mobile workstations that keep supplies organized and secure, yet ready at a moment�s notice. Choose from hundreds of accessories to improve efficiency and accessibility without compromising your budget. Maneuverability, reliability and storage are just a few of the features you�ll find standard on every crash cart we sell. Cart accessories focus on security, organization and accessibility and include everything from crash cart boxes, lids and dividers to foam inserts, security bags and security seals. In-stock or specially designed labels and vinyl graphics help maximize productivity by making it easy to identify drawer contents, departments and types of equipment. We make it easy for you to know exactly what�s inside your cart at any time, any place and in any situation! Visit us online to learn about our full inventory of cart solutions and find out how to build your cart to match your requirements. If you don�t find what you�re looking for, our talented team of product experts is ready to help! We offer a complete line of mobile transport solutions for the hospital, healthcare and education markets from Waterloo Health Care, Phoenix, and Lakeside, names you can trust for quality and dependability. 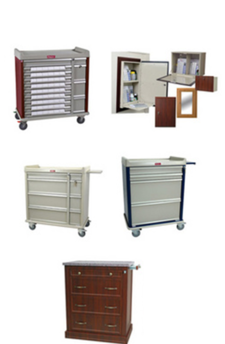 Our healthcare carts come in a variety of drawer and compartment configurations to fit most any storage situation. Punch card dispensing carts allow maximum flexibility for 30 days of medication and patient supplies. This Key Locking Half Sized Pill Card Cart, holds up to 300 6"x9" pill cards. 2-locking, 2-swivel casters enable you to place this cart where you need it. Choose from common configurations or let us design your perfect cart. Our treatment carts come in 3 drawer to 6 drawer models and 16 colors. These carts can be customized to fit your needs. Drawer and lock options along with free dividers in every drawer make these carts the economical choice. We offer convenient online ordering or we would be happy to take your order over the phone! 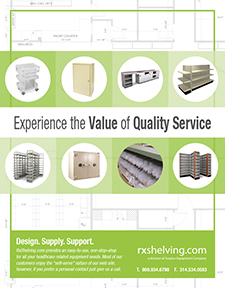 Rx Systems, Inc. is a family owned manufacturer and full-service provider of pharmacy packaging and supplies providing community and institutional pharmacies with quality products including MEDICATION CARTS, Pill Cards. Rx labels, Bags, Vials and the Eyecon Pill Counter. Rx Systems� Medication Carts have a wider base vs. similar sized carts from other manufacturers that increases capacity up to 150 pill cards. The design allows you to purchase a smaller cart while still realizing the same capacity as a larger cart from another supplier. Most carts are in stock and available for immediate shipment. Rx Systems' aluminum medication carts are all MODULAR! 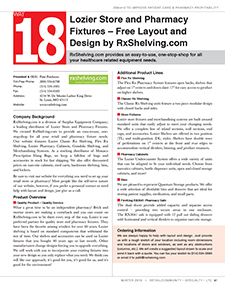 Modular design allows you to replace a part (dented end panel or drawer front, etc. ), versus the entire cart. 20-35% greater Pill Card capacity than competitor�s comparable carts. Available in four different cabinet sizes with standard cream finish or three stylish wood like finishes. Hard-baked powder coat for a maintenance free, enduring finish. 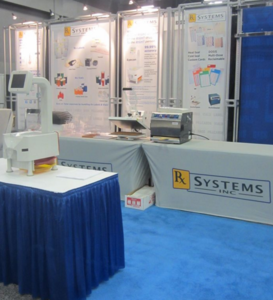 Adjustable dividers to custom fit other systems, such as DISPILL, Strip Packs, and Medicine On Time�. Carts & Accessories mount easily with thumb screws. Best� lock to ensure smooth and dependable operation. Delivered 100% assembled and ready to use. The Harloff Company has been building carts for over 50 years. 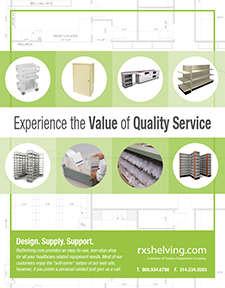 We offer the most complete line of medication carts available today designed to meet industry requirements for sizes and packaging options. Harloff designs long term care carts and in room cabinets for medication storage, as well as correctional medication carts and pharmacy med carts. Our line of medication furniture carts and in room resident cabinets provides facilities with the opportunity to embrace culture change with an attractive alternative to traditional medication carts. Designed to look like a piece of furniture with an internal design and proven locking system that will last. The in-room resident medication cabinets are offered in two models and decorative door fronts. The cabinets serve 1 or 2 residents with a capacity of 40 punch cards. The slam lock provides an easy one hand open and close and both cabinets provide a work area. 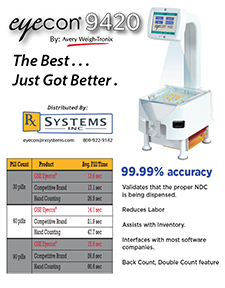 Punch Card medication carts continue to be our top sellers. Capacities range from 240 cards to 600 plus cards. We have small med carts that serve group homes, assisted living and small long term care units. Our larger medication carts allow the busiest nursing units to carry all their supplies with them during medication passes. Bin Carts offer an economic option to cassette carts and come with bin size choices. Our bin medication cart option provides an easy solution for strip packaging, PACMED®, AutoMed®, OPUS®, Vials, bottles and cassettes. Bin carts are available in either dual column or single column design. Harloff Unit Dose medication carts are adaptable to hold other types of medication packaging. 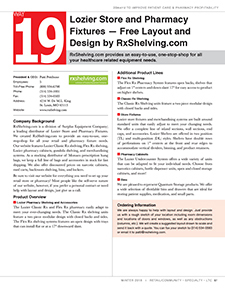 Provide the height, width and depth of your packaging and we will provide a divider option. Our specialty packaging carts have been designed to meet the needs of a variety of packaging to include Medicine-On-Time®, Opti-Pak®, and 4� tall plastic bins that hold AutoMed® or PACMED. 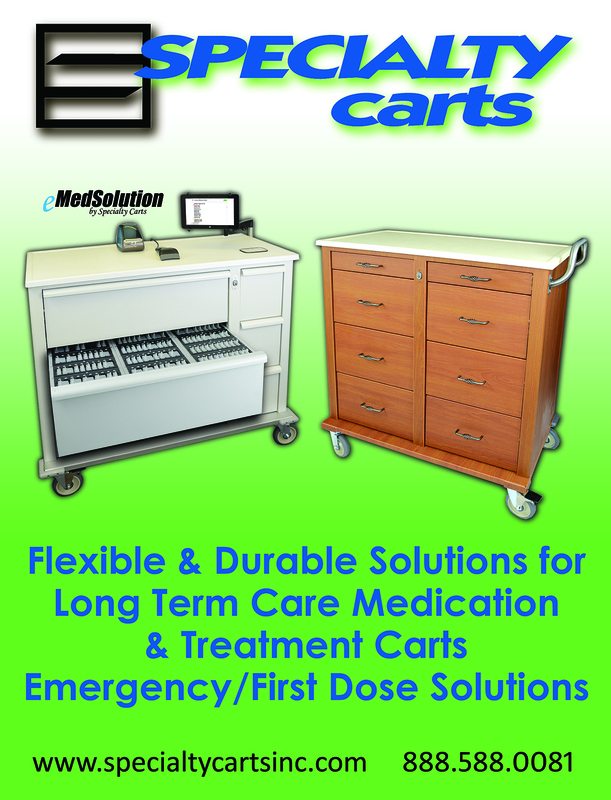 We have the capability to manufacture MOT® Med carts, and Dispill® Med Carts. Located in Colorado Springs Colorado, Harloff carts are built in the U.S.A. Our Long Term Care Correctional Sales Team will be happy to help you with your cart decision. 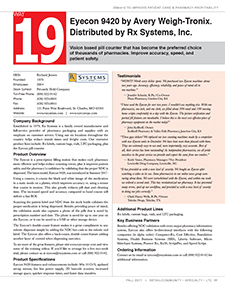 Rx Systems, Inc. is a family owned manufacturer and full-service provider of pharmacy packaging and supplies that provides independent community and institutional pharmacies with quality products including, Rx labels, bags, vials, medication carts and pill cards. 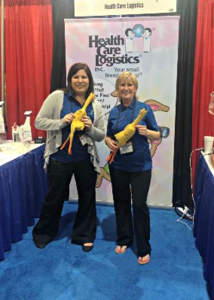 Total Pharmacy Supply is a wholesale distributor of pharmacy supplies to independent, chain, hospital, and long-term care pharmacies nationwide. Product lines include medication compliance aids, durable medical equipment, prescription packaging, dispensing supplies and equipment, bags, forms, and other supplies. Metro, a world leader in providing technology, storage and transport solutions for healthcare facilities, today announced their new Metro SecureRx MD System. Available exclusively on the Metro Flo Series of hybrid medication workstations, the SecureRx MD System communicates seamlessly with Metro MedDispense® Automated Dispensing Systems as well as other leading automated dispensing cabinets (ADCs) to improve the tracking, control and delivery of patient specific medications to the bedside.